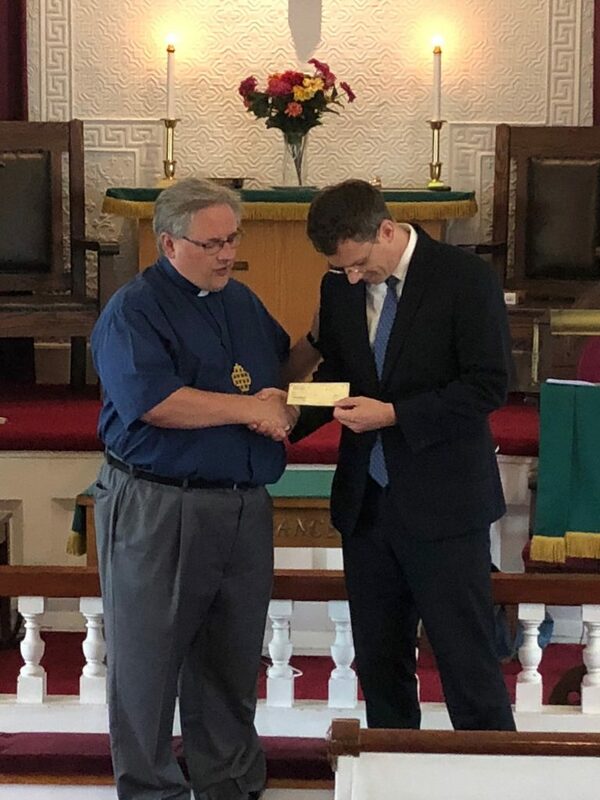 STOCKTON – On Sunday, Aug 18, Kingwood United Methodist Church donated $10,000 to the Maker’s Place, a new mission initiative of Greater New Jersey in Trenton. J. Rev. Michael Reed was there to receive the donation and introduce the Maker’s Place to the congregation. “We believe that we can do more when we do it together,” Reed said. The Maker’s Place, which takes its name in part from the famous ‘Delaware River bridge with the sign ‘Trenton Makes – The World Takes’, exists to connect neighbors in Trenton with neighbors in the surrounding area of central New Jersey. Reed was appointed to the ministry in July. Reed said the money will be put towards laying the groundwork for the initiative. The Maker’s Place plans to offer services for low-income families, including afterschool programming and the distribution of winter clothing, later this year. The Maker’s Place is being built on the concepts learned at the Church of All People in Columbus Ohio. The plan is to establish the mission initiative and launch a worshipping community from that foundation. After Kingwood UMC in Stockton received a generous bequest in 2017, Rev. Peter Mantell challenged his congregation to identify several United Methodist ministries they wished to support. “We cannot stop being the church simply because our bank account is enriched,” he said. Mantell led the congregation through a time of discernment, in which money was set aside for various mission and outreach programs.